To address shortfalls in Medicaid financing and billions in annual uncompensated care costs, Ted Shaw, president and chief executive of the Texas Hospital Association, issued a call to action to hospitals on Friday. Citing shortfalls in Medicaid financing and billions in annual uncompensated care costs, the president and chief executive of the Texas Hospital Association said Friday that it was time for medical facilities to join together on a long-term strategy to compensate for the program's shortcomings. Shaw did not specify what such a solution would look like. A representative for the association said the board is considering a couple of proposals, but so far, none have gained traction. They've made it a top priority, he said, to find a solution that distributes available Medicaid financing more equitably than the current system. While Shaw praised the Texas Legislature for fully financing a pool of Medicaid payments to cover uncompensated care in the 2014-15 budget, he said hospital leaders must devise a long-term solution, because that money is fleeting. Texas' Republican leadership decided not to expand Medicaid for low-income adults under the Affordable Care Act, saying that the program needed to be fixed, not expanded. If the state had expanded Medicaid eligibility, it would have received $100 billion in federal funds over 10 years and would have to pay $15 billion from general revenue, according to a report by Billy Hamilton, a tax consultant and former deputy comptroller, for Texas Impact and Methodist Healthcare Ministries of South Texas Inc.
To finance the federal share of Medicaid expansion, the Affordable Care Act reduces payments to hospitals for uncompensated care. 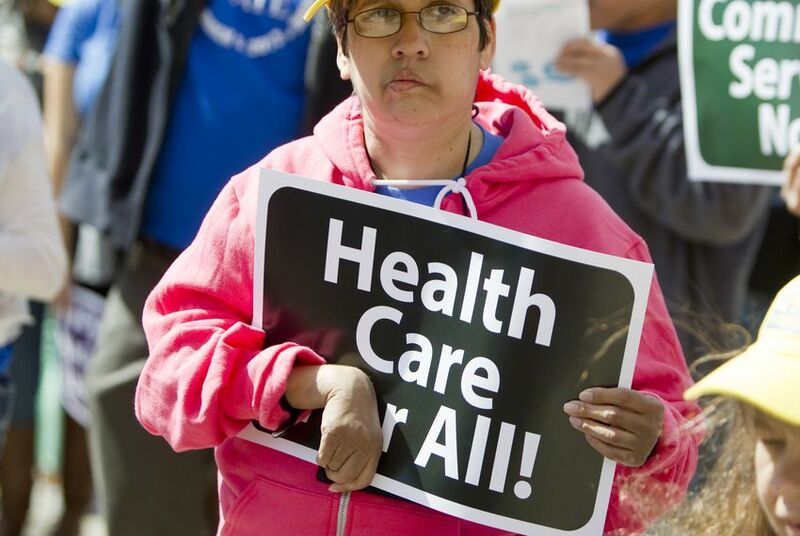 Federal lawmakers assumed Medicaid expansion would reduce the number of people without health insurance and, as a result, hospitals would incur less uncompensated care costs. Various cuts to Medicare payments to hospitals began in 2012. That means even though Texas did not expand Medicaid, hospitals across the state are still footing the bill. In 2016, Texas hospitals will receive $1.6 million less in federal Medicare money as a result of 2 percent cuts to Medicare reimbursements that began in March 2013, according to the Texas Hospital Association, which estimates hospitals already provide roughly $5 billion annually in uncompensated care. The Affordable Care Act, commonly known as Obamacare, requires most people to obtain health insurance in 2014. To help people find coverage, the law set up health insurance marketplaces, which offer tax credits for people who make 100 percent to 400 percent of the federal poverty threshold, to purchase private coverage. So far, 207,500 Texans have selected a health plan on the marketplace, but it’s unclear how many of those people were previously uninsured or have paid premiums on their policies. To help the poorest of the poor, the law initially required states to expand Medicaid eligibility to adults who make less than 138 percent of the federal poverty threshold. But the U.S. Supreme Court decided that the federal government could not force states to expand Medicaid, and as a result that provision of the law became optional. Gov. Rick Perry has consistently opposed the Affordable Care Act, and refused to expand Medicaid eligible to low-income adults. As a result, more than 1 million Texans living in the coverage gap — under $11,490 for an individual, and $23,550 for a family of four — don’t qualify for any type of assistance under the Affordable Care Act. Republican lawmakers considered an alternative “Texas solution” to Medicaid expansion during the 2013 legislative session that would have drastically reformed the program. That proposal failed, and ultimately the Legislature approved a requirement that the Health and Human Services Commission receive legislative approval before expanding Medicaid eligibility. The earliest that Medicaid expansion could again be addressed is in the 2015 legislative session, unless a special session is called to discuss this issue. Texas has also received a transformational Medicaid waiver from the federal government, which could bring an additional $29 billion to the state over five years. The waiver replaces a stream of county tax dollars that used to supplement Medicaid payments to hospitals with two new pools of money that combine financing from federal, state and county coffers. One pool will reimburse health care providers based on the volume of uncompensated care they provided for Medicaid patients and the uninsured. The second is a risk-based incentive pool aimed at encouraging providers to roll out experimental programs that improve the quality of care while reducing costs. The experimental incentive pool could dispense up to $11.4 billion to Texas health providers. But 60 percent of that financing is federal matching dollars that are contingent upon whether providers meet quality and efficiency standards. To meet those standards, providers must use local tax dollars — from hospital districts, for example — to create programs and partnerships that improve their region’s health care system. In some cases, private and nonprofit hospitals have agreed to also contribute money for the programs, but the federal government will not match those dollars. The projects that the federal government initially approved in May use just two-thirds of the $5 billion available for experimental projects over the next two years, partly a result of some regions being unable to find enough local financing to draw more federal dollars. This story was produced in partnership with Kaiser Health News, an editorially independent program of the Henry J. Kaiser Family Foundation, a nonprofit, nonpartisan health policy research and communication organization not affiliated with Kaiser Permanente.